With v12 also comes a brand new scanning engine, re-engineered and re-written from the ground up, making Acunetix the fastest scanning engine in the industry. – Announced Nicholas Sciberras, CTO. 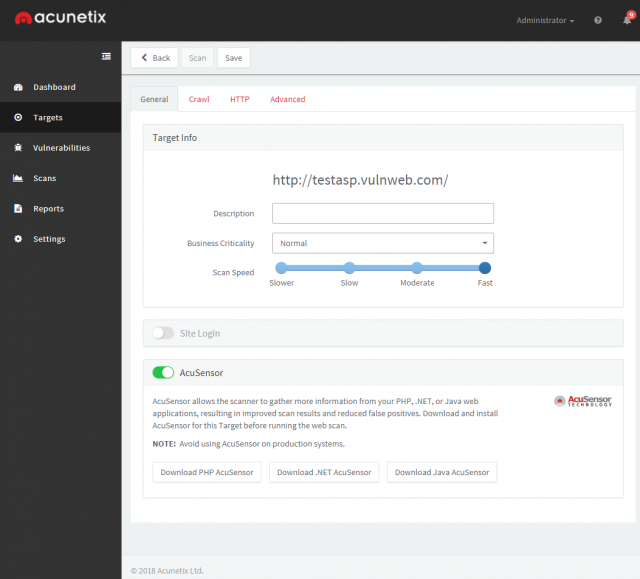 Acunetix version 12 includes a new AcuSensor for Java web applications. This improves the coverage of the web site and the detection of web vulnerabilities, decreases false positives and provides more information on the vulnerabilities identified. While already supporting PHP and ASP .NET, the introduction of Java support in AcuSensor means that Acunetix coverage for interactive gray box scanning of web applications is now possibly the widest in the industry. Combining the fastest scanning engine with the ability to scan multiple sites at a time, in a multi-engine environment, allows users to scan thousands of sites in the least time possible. The Acunetix Multi-engine setup is suitable for Enterprise customers who need to scan more than 10 websites or web applications at the same time. This can be achieved by installing one Main Installation and multiple Scanning Engines, all managed from a central console. Acunetix Version 12 allows the user to pause a Scan and Resume the scan at a later stage. Acunetix will proceed with the scan from where it had left off. There is no need to save any scan state files or similiar – the information about the paused scan is automatically retained in Acunetix. CloudFrunt is a Python-based tool for identifying misconfigured CloudFront domains, it uses DNS and looks for CNAMEs which may be allowed to be associated with CloudFront distributions. This effectively allows for domain hijacking. CloudFront is a Content Delivery Network (CDN) provided by Amazon Web Services (AWS). CloudFront users create “distributions” that serve content from specific sources (an S3 bucket, for example). Each CloudFront distribution has a unique endpoint for users to point their DNS records to (ex. d111111abcdef8.cloudfront.net). All of the domains using a specific distribution need to be listed in the “Alternate Domain Names (CNAMEs)” field in the options for that distribution. If the HOST header does not match an entry in the “Alternate Domain Names (CNAMEs)” field of the intended distribution, the request will fail. Any other distribution that contains the specific domain in the HOST header will receive the request and respond to it normally. The domain “test.disloops.com” is a CNAME record that points to “disloops.com”. The “disloops.com” domain is set up to use a CloudFront distribution. Because “test.disloops.com” was not added to the “Alternate Domain Names (CNAMEs)” field for the distribution, requests to “test.disloops.com” will fail. Another user can create a CloudFront distribution and add “test.disloops.com” to the “Alternate Domain Names (CNAMEs)” field to hijack the domain. This means that the unique endpoint that CloudFront binds to a single distribution is effectively meaningless. A request to one specific CloudFront subdomain is not limited to the distribution it is associated with. Airbash is a POSIX-compliant, fully automated WPA PSK handshake capture script aimed at penetration testing. It is compatible with Bash and Android Shell (tested on Kali Linux and Cyanogenmod 10.2) and uses aircrack-ng to scan for clients that are currently connected to access points (AP). Those clients are then deauthenticated in order to capture the handshake when attempting to reconnect to the AP. Verification of a captured handshake is done using aircrack-ng. If one or more handshakes are captured, they are entered into an SQLite3 database, along with the time of capture and current GPS data (if properly configured). After capture, the database can be tested for vulnerable router models using crackdefault.sh. It will search for entries that match the implemented modules, which currently include algorithms to compute default keys for Speedport 500-700 series, Thomson/SpeedTouch and UPC 7 digits (UPC1234567) routers. After capturing a new handshake, the database can be queried for vulnerable router models. If a module applies, the default keys for this router series are calculated and used as input for aircrack-ng to try and recover the passphrase. Running install.sh will create the database, prepare the folder structure and create shortlinks to both scripts which can be moved to a directory that is on $PATH to allow execution from any location. After installation, you may need to manually adjust INTERFACE on line 46 in airba.sh. This will later be determined automatically, but for now the default is set to wlan0, to allow out of the box compatibility with bcmon on Android. – ./airba.sh starts the script, automatically scanning and attacking targets that are not found in the database. – ./crackdefault.sh attempts to break known default key algorithms. To view the database contents, run sqlite3 .db.sqlite3 "SELECT * FROM hs" in the main directory. XXEinjector is a Ruby-based XXE Injection Tool that automates retrieving files using direct and out of band methods. Directory listing only works in Java applications and the brute forcing method needs to be used for other applications. XXEinjector actually has a LOT of options, so do have a look through to see how you can best leverage this type of attack. Obviously Ruby is a prequisite to run the tool. --host	Mandatory - our IP address for reverse connections. (--host=192.168.0.2) --file	Mandatory - file containing valid HTTP request with xml. You can also mark with "XXEINJECT" a point where DTD should be injected. (--file=/tmp/req.txt) --path	Mandatory if enumerating directories - Path to enumerate. 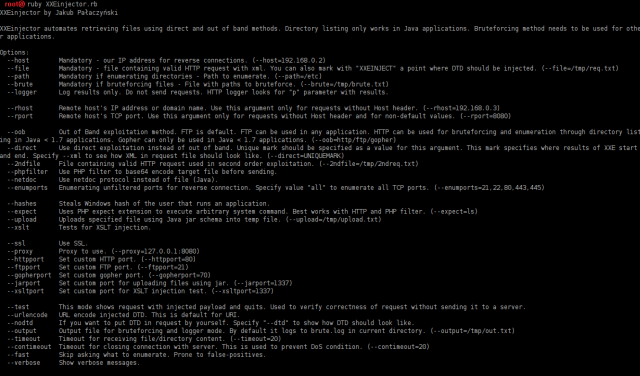 (--path=/etc) --brute	Mandatory if bruteforcing files - File with paths to bruteforce. (--brute=/tmp/brute.txt) --logger	Log results only. Do not send requests. HTTP logger looks for "p" parameter with results. --rhost	Remote host's IP address or domain name. Use this argument only for requests without Host header. (--rhost=192.168.0.3) --rport	Remote host's TCP port. Use this argument only for requests without Host header and for non-default values. (--rport=8080) --oob	Out of Band exploitation method. FTP is default. FTP can be used in any application. HTTP can be used for bruteforcing and enumeration through directory listing in Java < 1.7 applications. Gopher can only be used in Java < 1.7 applications. (--oob=http/ftp/gopher) --direct	Use direct exploitation instead of out of band. Unique mark should be specified as a value for this argument. This mark specifies where results of XXE start and end. Specify --xml to see how XML in request file should look like. (--direct=UNIQUEMARK) --cdata	Improve direct exploitation with CDATA. Data is retrieved directly, however OOB is used to construct CDATA payload. Specify --cdata-xml to see how request should look like in this technique. --2ndfile	File containing valid HTTP request used in second order exploitation. (--2ndfile=/tmp/2ndreq.txt) --phpfilter	Use PHP filter to base64 encode target file before sending. --netdoc Use netdoc protocol instead of file (Java). --enumports	Enumerating unfiltered ports for reverse connection. Specify value "all" to enumerate all TCP ports. (--enumports=21,22,80,443,445) --hashes	Steals Windows hash of the user that runs an application. --expect	Uses PHP expect extension to execute arbitrary system command. Best works with HTTP and PHP filter. (--expect=ls) --upload	Uploads specified file using Java jar schema into temp file. (--upload=/tmp/upload.txt) --xslt	Tests for XSLT injection. --ssl	Use SSL. --proxy	Proxy to use. (--proxy=127.0.0.1:8080) --httpport	Set custom HTTP port. (--httpport=80) --ftpport	Set custom FTP port. (--ftpport=21) --gopherport	Set custom gopher port. (--gopherport=70) --jarport	Set custom port for uploading files using jar. (--jarport=1337) --xsltport	Set custom port for XSLT injection test. (--xsltport=1337) --test	This mode shows request with injected payload and quits. Used to verify correctness of request without sending it to a server. --urlencode	URL encode injected DTD. This is default for URI. --nodtd	If you want to put DTD in request by yourself. Specify "--dtd" to show how DTD should look like. --output	Output file for bruteforcing and logger mode. By default it logs to brute.log in current directory. (--output=/tmp/out.txt) --timeout	Timeout for receiving file/directory content. (--timeout=20) --contimeout	Timeout for closing connection with server. This is used to prevent DoS condition. (--contimeout=20) --fast	Skip asking what to enumerate. Prone to false-positives. --verbose	Show verbose messages. --logger	Log results only. Do not send requests. HTTP logger looks for "p" parameter with results. --cdata	Improve direct exploitation with CDATA. Data is retrieved directly, however OOB is used to construct CDATA payload. Specify --cdata-xml to see how request should look like in this technique. --phpfilter	Use PHP filter to base64 encode target file before sending. --netdoc Use netdoc protocol instead of file (Java). --hashes	Steals Windows hash of the user that runs an application. --xslt	Tests for XSLT injection. --test	This mode shows request with injected payload and quits. Used to verify correctness of request without sending it to a server. --urlencode	URL encode injected DTD. This is default for URI. --nodtd	If you want to put DTD in request by yourself. Specify "--dtd" to show how DTD should look like. --fast	Skip asking what to enumerate. Prone to false-positives. Ah Yahoo! in trouble again, this time the news is Yahoo! fined for 35 million USD by the SEC for the 2 years delayed disclosure of the massive hack, we actually reported on the incident in 2016 when it became public – Massive Yahoo Hack – 500 Million Accounts Compromised. Yahoo! has been having a rocky time for quite a few years now and just recently has sold Flickr to SmugMug for an undisclosed amount, I hope that at least helps pay off some of the fine. The Disaster Formerly Known as Yahoo! has been fined $35m by US financial watchdog, the SEC, for failing to tell anyone about one of the world’s largest ever computer security breaches. Now known as Altaba following its long, slow and painful descent in irrelevance, Yahoo! knew that its entire user database – including billions of usernames, email addresses, phone numbers, birthdates, passwords, security questions – had been grabbed by Russian hackers back in December 2014 – just days after the break-in occurred. 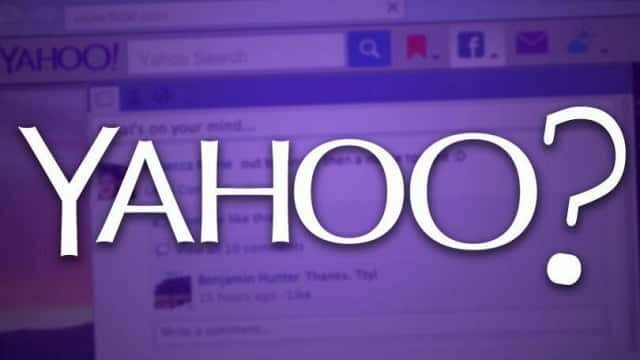 Security staff informed senior Yahoo! management and its legal department, who then demonstrated the same kind of business and strategic nous that saw the company fold into itself when they decided to, um, not tell anyone. It wasn’t until two years later when telco giant Verizon said it wanted to buy the troubled company that Yahoo! finally revealed the massive breach. The SEC is, understandably, not overly impressed. “Yahoo! failed to properly investigate the circumstances of the breach and to adequately consider whether the breach needed to be disclosed to investors,” it said Tuesday, before the co-director of its enforcement division, Steven Peikin, gave what amounts to a vicious burn in the regulatory world. Honestly, it was a pretty shady move, they knew about the compromise DAYS after the incident, it was escalated to the legal team and the senior management – they had material information but they chose to sit on it until the Verizon acquisition was on the table and due diligence would have uncovered it anyway. Not exactly responsible disclosure or doing the best for the customers is it? But then, that’s Yahoo! and decisions like that demonstrate exactly why they are irrelevant today in 2018. Yahoo! should have let investors know about the massive breach in its quarterly and annual reports because of the huge business and legal implications to its business, the SEC said. But it didn’t of course – probably because it was already desperate to get someone to buy it following years of abortive efforts by CEO Marissa Meyer to turnaround what was once the internet’s poster child. The SEC also found that Yahoo! did not share information on the breach with either auditors or its outside lawyers. The Canadian who helped the Russians gain access to the data faces eight years in jail. Yahoo! has “neither admitted nor denied the findings in the SEC’s order” – which is so Yahoo!. For some reason Verizon still bought the dried out husk of the company in June 2017, although it extracted a significant reduction in the share price. It paid $350m less than its initial offer but it is estimated that it will cost Verizon $500m to clean up the mess Yahoo! left behind. I’m starting to wonder if they will even still exist in 2025 or will have totally faded to join AskJeeves and Altavista. The only value in Yahoo! today is basically it’s stake in Alibaba, Verizon bought it for 5% of it’s peak value and now it’s probably worth even less (Maybe only $1-2 Billion vs $100 Billion at its peak). Drupwn is a Python-based Drupal Enumeration Tool that also includes an exploit mode, which can check for and exploit relevant CVEs. Drupwn can be run, using two separate modes which are enum and exploit. The enum mode allows performing enumerations whereas the exploit mode allows checking and exploiting CVEs.